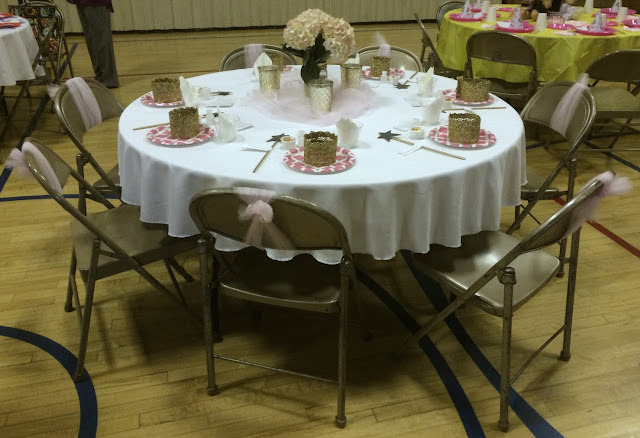 I'm sharing these pictures of the decorated table the night of the celebration before the event started. If I wait until we celebrate my daughters birthday too, well, I may never end up sharing. Sadly, I'm just that way. Once an event is over, I move on and forget to share things I've done! (As I'm sure any regular reader may have noticed). My favorite part of the whole table was the centerpiece. 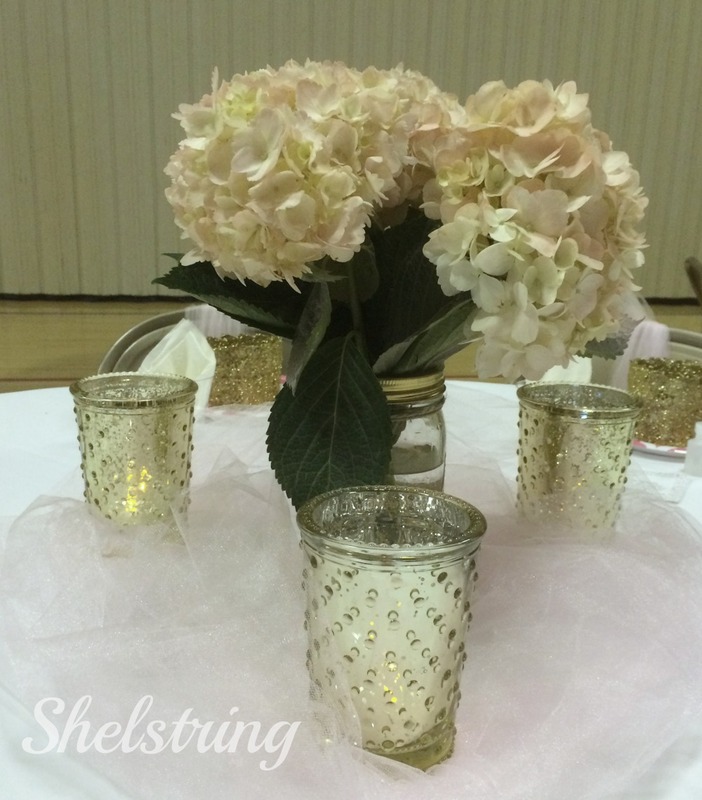 I used the idea of glittering a wide mouth mason jar and bought some hydrangeas at the grocery store to fill it. The candle holders were a Target find at Christmas time. They held battery operated candles from the dollar store. The flowers and candles were placed on some fluffed pink tulle. 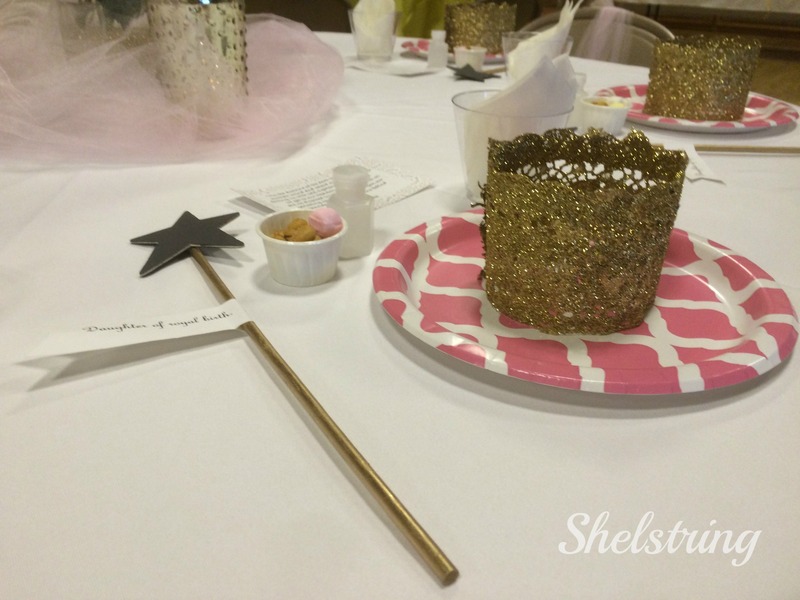 In case you're wondering, the process of making the glittered jar was as simple as this. 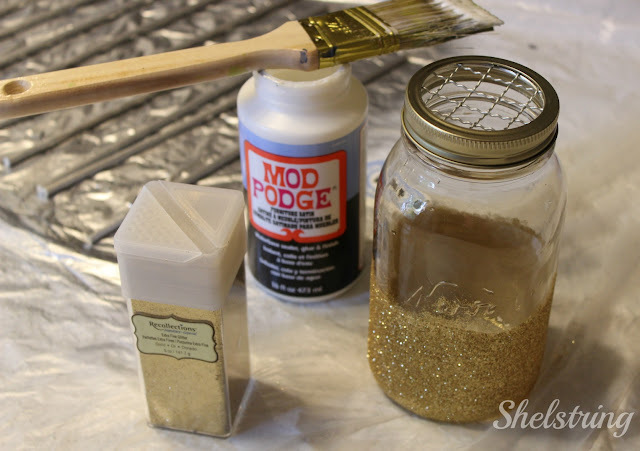 Paint mod podge where you want the glitter, and then sprinkle with fine glitter (I purchased mine at Michaels) and let dry. I added a floral arranging cap insert to the lid (also from Michael's). 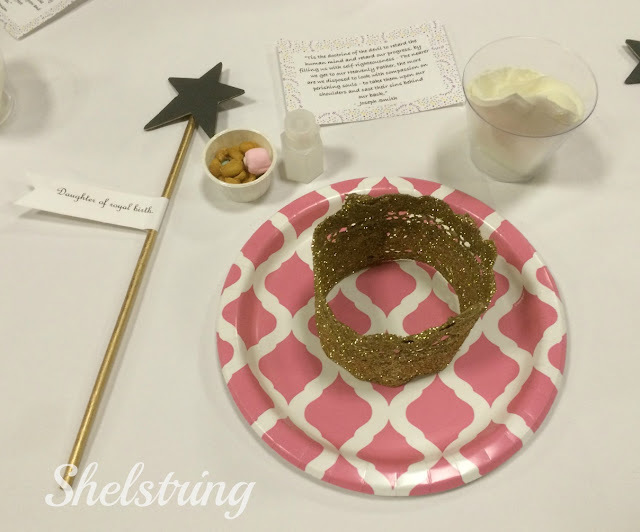 The place setting was fun, yet the most time consuming. 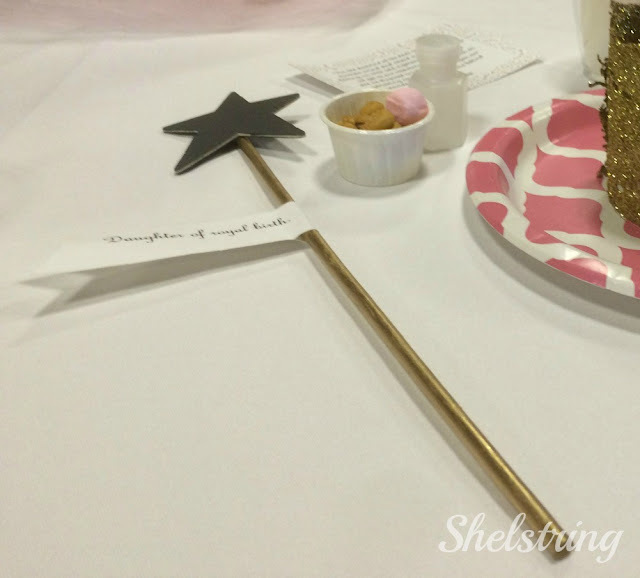 The wands were pre-cut dowels spray painted gold and then a chalkboard painted wooden star hot glued to the ends. I made a tag on sticky paper, cut into strips, then notched on the end. These turned out to be a lot of fun. The crowns were the most challenging of all. I followed a tutorial (here) and came up with my own method when that didn't prove to work out well for me. I'd seen this idea years ago and knew that one day I would make them. 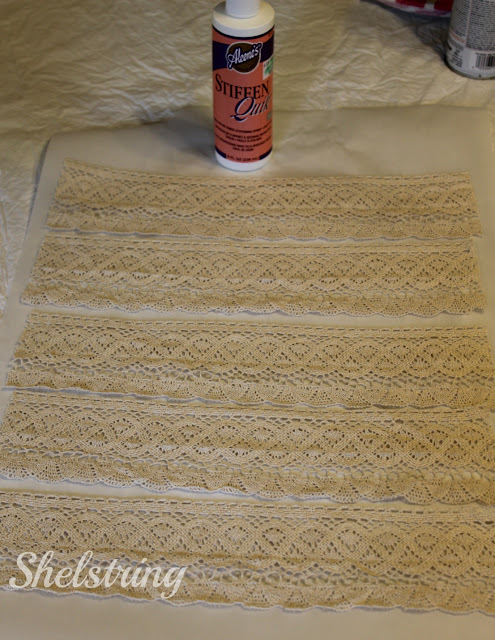 They started out as ecru color crocheted lace. 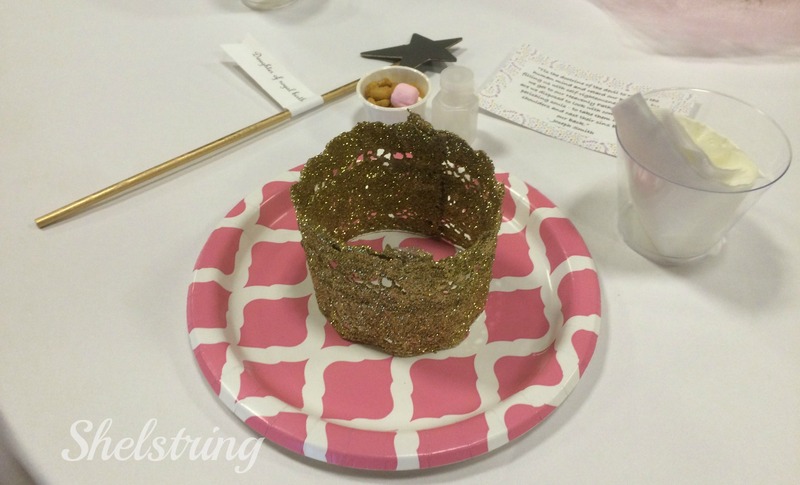 The idea was to use fabric stiffener, paint, glitter, and hot glue together in a crown shape. This didn't go so well for me. I stiffened them and let them sit for hours. 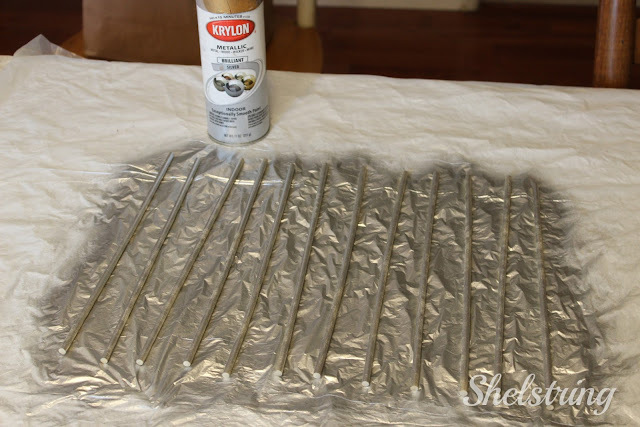 When they weren't hard enough, I used mod podge, as the tutorial demonstrates, but it just wasn't drying very fast. I finally stared painting the mod podge on with a paint brush, applying a generous amount of glitter, then transfering them onto a parchment paper covered cookie sheet to bake in the oven at 275 for around 5-10 min. I didn't bother painting them with acrylic paint. I found the glitter coated them well enough to skip this step. Baking in the oven was a much quicker, and more effective method. 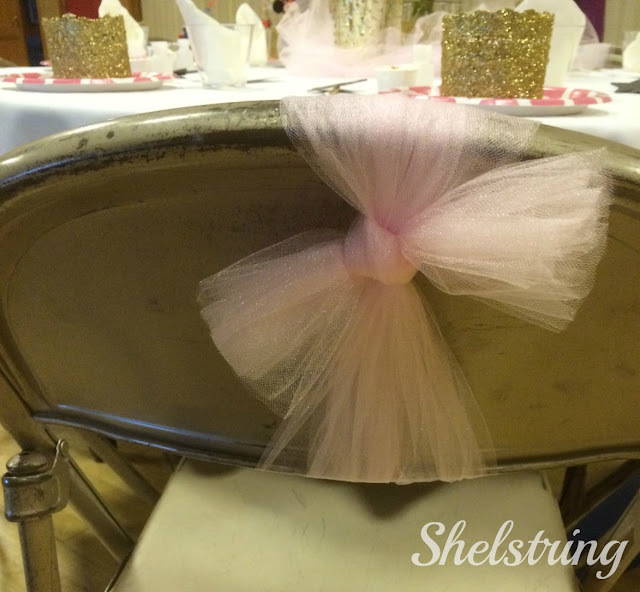 Last, I did the best I could with the chairs by tying a bit of tulle around the tops. 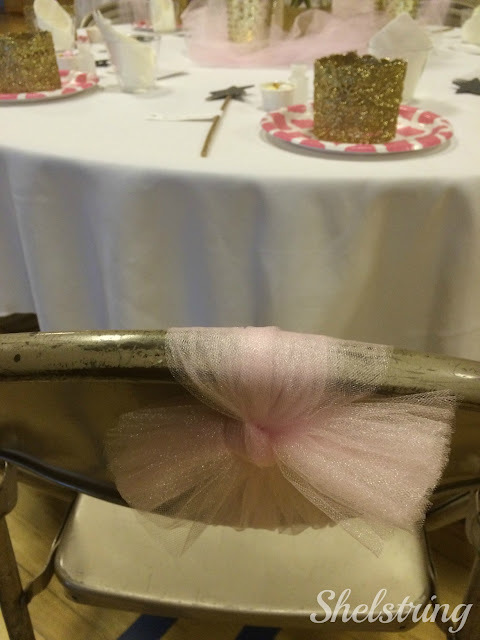 This was the best attempt I could make in beautifying these (very practical) chairs without making a complete cover for them. The ladies were so gracious about the whole setting. We enjoyed a piece of birthday cake and assembled humanitarian bags for our local homeless Mission. 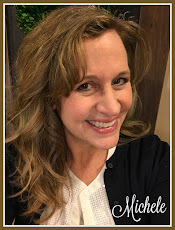 It was so wonderful to learn of their program and be a part of that service which is right in line with the purpose of the Relief Society, offering relief and uplifting others through service. I loved the celebration of an organization that has been such a blessing in my life. Now I can't wait to celebrate another great blessing, my sweet daughter's birthday! 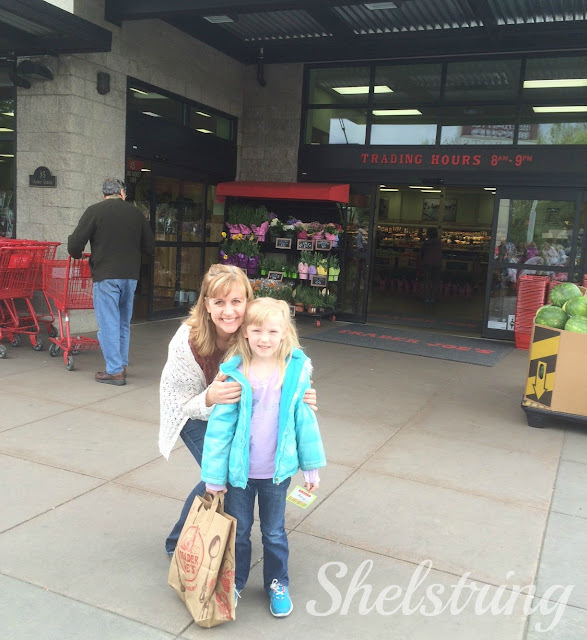 We just went on a fun field trip to Trader Joe's with her class yesterday.